Marta Szostak is the coordinator of Astra, the Central and Eastern European Women's Network for Sexual and Reproductive Health and Rights, based in Poland. We spoke to Marta about the current situation in the region for women and women’s rights organisations. What is the Astra Network? Astra is an informal network made up of 39 member organisations in 21 countries in central and eastern Europe. We have been around for over 17 years and we were founded at a time when the region was invisible on the global map of advocates and human rights activists. We work on sexual and reproductive health and rights (SRHR), with a focus on access to safe and legal abortion, contraception, and comprehensive sexuality education (CSE). We communicate online and we have annual meetings which we combine with peer-learning and capacity building. The aim is to support the members in their work and to bring their voices to international spaces through advocacy at an EU and UN level. Because it’s an informal network, we have a lot of freedom to speak. We empower our members to be more aware of international opportunities and build skills for advocacy work at a national level. What do you see as being the biggest challenges for sexual and reproductive rights in central and eastern Europe? The reality of this region is a bit different to western Europe, especially in terms of human rights and the civil society movement. The history is different and the common experience of post-Soviet countries is something that unites this region. There are multiple challenges and there are different issues that are difficult in each country. For example, Poland is one of the few countries in Europe where abortion is not available so that is the major challenge here, while in other countries LGBT rights are under attack. Across the region, there is a lack of political will to commit to women’s rights and women’s health in general, and there’s very little understanding of how women’s rights are fundamental to a modern, democratic society. There’s also still a lot of fear and desire to control women’s bodies and women’s bodily autonomy. All the discourse we have seen in the US, driven by President Trump, about making America great again and investing in families – the same thing is happening here. This discourse around tradition and family is particularly present in Hungary, Poland and Croatia but also other places. In a way, I see it as being about nationalising women’s bodies and controlling their decisions out of fear. Of course, there’s also the financial aspect – those who have money can afford reproductive health services at private facilities or abroad and access to modern contraception. However, things should not be this way, as the poorest are always those who suffer most due to flaws in the system. And the market can often profit from this situation. What other barriers do women face in accessing sexual and reproductive health services? There is a widespread practice of conscientious objection (by medical providers). It’s becoming very problematic because it’s spreading beyond abortion to other issues, such as pharmacists refusing to sell contraception or emergency contraception. There are also economic and practical barriers. Armenia is a good example, because abortion is legal and on paper it’s available. But there are still barriers, such as women and health professionals simply not knowing how to use medical abortion. You can buy pills at the pharmacy, but if you don’t know how to use them you might not have a successful abortion. Or you may have to travel to another city to get a surgical abortion and you need time and resources to do that. It’s very common for men to work away from the home, so women have to leave their children with someone in order to travel, and that can be a barrier. Across the region, it is possible to get the services you need as long as you have money and social support. But that leaves a lot of women who are not so privileged, so that’s the second level, that you need to have laws that work, you need to have political will and you need to have social support as well. That will not happen overnight. Another barrier is abortion stigma, which is basically everywhere. In the last two years in Poland, we had a few so-called abortion ‘coming outs’. One public figure, a singer, gave an interview to a woman’s weekly newspaper in which she described travelling to Slovakia for an abortion. There was so much backlash against her and so much hatred. I don’t think anybody else from the public sphere will have the courage to speak publicly like that again for a long time. Widespread abortion stigma and the widespread urge to control women’s bodies are important barriers to women speaking openly. What challenges do organisations working in this area face? There are many challenges. Here in Poland, helping a person obtain an abortion that’s not within the current law is criminalised. This has also led to much misunderstanding around how much one can say about ways to terminate a pregnancy that does not fit in the narrow, allowed cases. Very often there is a lack of reliable information on abortion itself, however in the recent years, also thanks to a widespread use of social media, this is slowly changing and women are also more open in giving each other support and directing each other to reliable sources. 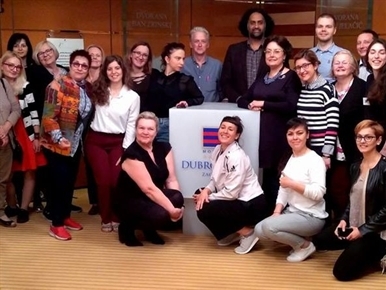 The Federation for Women and Family Planning, the women’s NGO in Warsaw, which hosts the Astra secretariat, was targeted by a group of catholic lawyers, who were behind the 2016 bill to ban abortion in Poland and criminalise women. They came up with this story that Astra organised the black protests (a mass movement against the bill). It’s pure nonsense, as although we did support the protest, it was a totally spontaneous social movement. But I was mentioned online, my photo was used, and it was uncomfortable. In Armenia, organisations and activists involved in work around a domestic violence bill have been harassed online and in person. Generally, the climate around women’s human rights defenders is thickening, and the situation is very difficult. In Hungary and Russia, organisations have been brought in for questioning by the government about what they do, how they operate and where they get their funding. It is immensely difficult and emotionally draining. Another barrier that organisations face in the region is funding. There is less and less money for work on abortion, and for funders from abroad, abortion is becoming a difficult issue. They sometimes say very nicely that they would prefer to work on an issue like violence against women, which is a safe topic. There are fewer funds for youth activities, especially in the field of SRHR. What do you see as being behind the rise in the anti-choice movement? Anti-rights tendencies have been around forever and they will not disappear. But I think the political climate has changed in recent years in Europe and in the US and that has a huge influence. It has created fertile ground for many anti-choice initiatives that have been hidden for a long time. There is more tolerance of saying things that would not have been said in the public sphere five years ago. The anti-abortion movement in central and eastern Europe is much inspired by the American movement. The images are the same, the tactics are much the same. The so-called immigrant crisis and what’s happening on the borders, that’s also creating a sense of fear, and this idea that we need to have a closed, traditional country. Even though Poland has very few immigrants, there’s huge hatred in the social sphere towards people of colour, it’s just incredible. I think that also creates this fertile ground for these kinds of movements – neo-fascist and populist movements. And we must not forget that in the recent years we have seen conservative and right-wing governments (especially on social issues) come to power in numerous countries within the European Union and its neighbours, often openly criticizing the EU institution in itself. What is being done or could be done to push back against it? I think what needs to be done is generally more co-operation on different levels and I think that is already happening. But my personal view is also that this time will pass. Even though a lot of harm has already been done, I do believe this will pass, and one day the governments will change. In Poland, I think it’s more complicated because the abortion issue is not really just an issue of the current government. It has been around for many years. In general, there needs to be more political will and perhaps more pressure from the EU and the UN, although it’s not clear whether that is helpful. Every time the EU has recommended something around abortion or contraception, it has been pushed back with double force, so I think it has to be a process from within. Change has already started to happen. Since the black protests, the number of pro-choice people in Poland is on the rise and women are actually more educated and empowered. It has also had an influence in the region. There have been solidarity protests in other countries and women in those countries have been encouraged to demand their rights. Especially in Croatia, where the government will be debating a new abortion bill very soon, there is a huge women’s movement that has been empowered by the movement in Poland. There has also been a lot of coverage of the movement in Argentina and the referendum in Ireland. But even though we have a lot in common, I personally don’t believe that the law will change in Poland anytime soon. I don’t think there’s enough courage in this nation. If you had one message for practitioners and policy makers in Europe today, what would it be? I would say trust women and trust their choices. Women know what they want to do with their bodies. Restricting whatever you wish to restrict will never work, it just harms those who do not have the resources. This eFeature appeared in the August 2018 edition of the Eurobulletin.